I loooove this foundation! I started using it years ago and was amazed by how well it works. I tried straying away from it a couple times only because I wanted to try different products and always ended up coming back to this one. I have fussy skin. I tend to get random breakouts and blemishes, which I can’t stand (obviously). Prior to using this, I used to get them a lot more. I found that when I would stray away from this and try other products (user cheaper ones) I would instantly start getting breakouts until I stopped using the cheap stuff. This feels very lightweight on my skin and never looks caked on or heavy. If you are looking for a natural looking foundation, look no further, this is it! I can wear this stuff alone or over top of another foundation to set it. On days when I don’t really feel like doing my makeup to the full extent, I just dust this over my face. 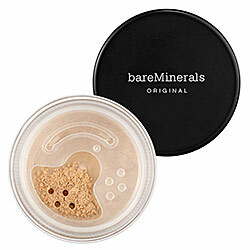 It covers blemishes and an uneven skin tones or imperfections. At this point….I really can’t think of any!